If you were to describe Olan de Mexico in three words, which words would you choose? The three best words to describe Olan de Mexico are Mexican, inspired and integrated. Mexican, since Olan was founded in Mexico, in 1975 as a fusion of two other companies, one of them belonged to my parents. Today, the company specializes in the manufacture of atomizers and cosmetic dispensers and all of that is produced in Mexico. We market our products globally. In Mexico, Olan's name and reputation has a long-standing credibility, since we have a very strong presence in the market. Our worldwide presence is also growing. Eight years ago, in Argentina, we set up a partnership with Buplasa, to distribute our products and strengthen our presence in South America. Also, three years ago we began a partnership with Retypack in Colombia which is also part of our strategy to enhance our reach across Latin America. These companies were specially selected and we have an excellent working relationship with both. Inspired describes Olan well, as the company works a lot on research and development, and responds directly to the needs of the market. We have an excellent catalog of products and a great number of patented products. We are suppliers to very well-known brands who choose us because of our reliable product quality, and also because of our forward-thinking ethos which reflects the culture of work at Olan as well as our respect for those around us. This is not just for our customers, but also for our employees and for the local and global environment. Integrated is for the team of 350 staff who work together at Olan. Olan is integrated in its local community and Olan is completely integrated in its manufacturing. Our product offering is also integrated with a high level of customer service and in turn, our company ways are integrated into the core of the business, how we work and of course our resulting reputation. What is the inspiration for developing new products at Olan? As a company we are fully integrated in manufacturing plastic packaging components for the beauty and fragrance markets. We design and produce sprayers, valves and dispensers. All our plastic components are produced in-house as well as some aluminum. We also work on full packages. In addition to all of that we produce high cavitation molds, so there is a lot happening at Olan all of the time. A lot of the work that we do is in response to market needs, so we keep a keen eye on what is happening and new developments so that we can prepare for the requirements of our customers. Olan is completely integrated into its manufacturing and product development. The technology that we use is state-of-the-art and we regularly invest in new machinery which helps us maintain our pioneering edge in product development. The Olan team works on a site that spans about ten thousand square meters so there is a lot of crossover and communication between departments. In addition to leading the team, I have a lot of active involvement with new product development at Olan. I'm interested in the technical side of things and I think it is important as the CEO that I am actively involved in various aspects of the business, to lead effectively, see the company profit and continue to expand in the future. I'm also involved with sales and customer relations and am available for customers to speak with about their projects or suggestions so that Olan can improve and enhance its offering and service. I mentioned before that Olan has an extensive selection of products available in its catalog, and the company also works on larger special projects as well, for customers that are looking for large volume orders. Special projects give us the opportunity to showcase our skill. As an example, the majority of our product molds are exclusive to Olan. The company benefits from many skilled professionals that work together in the creation and design of new products, and an active research and development team. Our research department is always developing new concepts for dispensing so that Olan maintains its position at the forefront of the industry. How does Olan differentiate its products from those of other companies? The quality of Olan's packaging products is what makes them stand out on the market. We have the products that the market wants, but ours are that little bit more refined, or offer more options. Our customer service is also exemplary and is the reason that many big name brands choose to work with us. On our website, olanmex.com, you can read a number of comments that our customers have made about working with us. The Avon one is particularly compelling as it reflects how well we work as a company. Avon comments that our team is experienced and dedicated, from management through to operators, and that the closeness and communication is visible to them. Avon also comments about how we at Olan have remained professional and proposed improvements for Avon, which of course is to the benefit of both companies. Avon is a company which has a strong research department of its own and appreciates the difference we can offer in our product quality, as does Fraiche, a very well-known company in the fragrance and personal care markets here in Mexico. For cream products, Olan uses a special material that is similar to a soft PP. It's a special resin mix that is unlike anything available with our competitors yet similar at the same time. Our product offers far greater chemical compatibility so that it doesn't experience the problems that Buna does. It is both Olan's products and its approach that makes it stand out against other packaging manufacturers in the market. Can you show examples of how Olan's product quality is a superior standard? An excellent example of this and of our new product development is a new lotion pump which is currently in production. This particular lotion pump has had a longer development time in comparison with similar products, however the result is a product that is one-of-a-kind. Olan's new lotion pump is one that can be activated with less force or pressure than any other lotion pump currently on the market. It's a dispenser that activates with a gentle touch. It gives brands opportunities to market their products to different consumer groups, such as children, mature citizens or those that have previously struggled with personal care products dispensed with a pump as well as making dispensing an easier proposition for "regular" consumers. Another example is the twist and lock sampler which Olan released onto the market 2 years ago. The product is still patent pending, but one of its primary features is that it uses the same motor function as a normal perfume bottle, yet is economic, and is available in 2ml, 3ml and 5ml. The twist and lock sampler has been highly successful since its launch. Olan's atomizers offer better dispensing. Actually 35-45% better than the rest of the market. 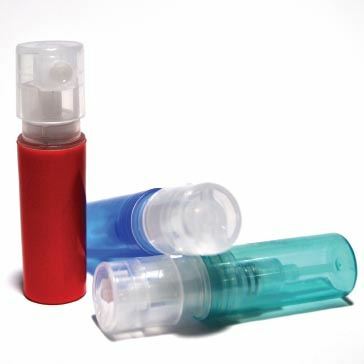 Fragrance dispensing standard is 80, but Olan dispenses 110-130mcl as standard. We've had a lot of enthusiastic feedback from upper management at brands about this type of differentiation as they recognize the difference that using our product will make in a highly competitive market. How does Olan yield 15% returns? We work in a market that has a lot of competition, especially in Argentina and China, but we recognize and understand that, therefore we have maintained our position through our quality promise. China had a reputation for price benefits for buyers, but there is inconsistent product quality. We don't compete with this market because we cannot match their prices as our product is consistently of high quality. In Mexico we have to comply with environmental laws and there are costs for patenting products. Olan's quality promise is related to the way in which the company works, which is by putting the customer at the center of everything we do. Our customers put their faith in us and trust our actions therefore it is important that our products meet and surpass expectation. As a consequence of this the consumer is highly important since he is the one who will ultimately be using our products. Increasing product quality and lowering costs are our drivers in order that our customers will be receiving their product order in a timely fashion at a just price. We invest in machinery to ensure that we always have the best option available, and we invest in different products and in the business. Since Olan sees an average 15% year-on-year growth, we know that this investment benefits the company. Our employees too are ambassadors of the company, the men and women who make it possible for Olan to maintain its business and exemplary reputation. Each individual is recognized for their worth in the team as we offer a fair wage with job security. Personal development and advancement within the company is encouraged along with a management team that leads and inspires, working competently to ethical ends. We also embrace suggestions from our team so that we can enhance operations and make Olan an even better place in which to work. A complaint is not negative, it is the opportunity to improve a problem or process. Our role in maintaining our community, our environment, our planet... Our responsibility to our shareholders to ensure that they yield a good profit... All of this is important to Olan and are the guiding principles by which we work. You can learn more about it on our website olanmex.com in the "About Us" section. Nowadays many brands place great importance on working with companies that have our work ethic because of the transparency it provides and the support it provides to that brands own work ethic. At Olan our profit and growth are related to the company's strong roots, whereby everyone works together as a team to ensure that we continue to move on and up. I am one member of that team and I am lucky to be leading Olan forward into the future.